While calls for more oil drilling dominate the headlines, experts say taking simple steps to use less could save twice as much. 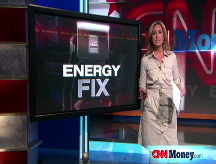 NEW YORK (CNNMoney.com) -- Want to help the country save a quick million barrels of oil a day? Drive 5% less. Slow down. Inflate your tires. Those three steps would reduce U.S. oil consumption by 1.3 million barrels a day immediately, according to the Alliance to Save Energy, a conservation group running an efficiency campaign backed not only by environmental groups but also the auto and oil industries. That's nearly twice the estimated daily oil production that could come from drilling in the Alaska's Arctic National Wildlife Refuge, according to the government's Energy Information Administration. According to Julius Pretterebner, a vehicles and alternative-fuels expert at Cambridge Energy Research Associates, a consultancy that does a lot of work for the oil companies, how fast people drive and how quickly they accelerate is responsible for 10% to 30% of fuel consumption. "It's significant, and it's the only thing we can do in the short term," said Deron Lovaas, vehicles campaign director at the Natural Resources Defense Council, which partners with the Alliance to Save Energy on an effort to educate drivers on efficiency. 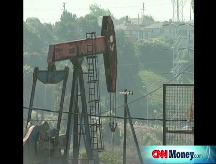 The United States consumes 20 million barrels of oil a day, nearly 10 million of which goes to making gasoline. The world gobbles up 85 million barrels of oil in all. Rather than focusing on reducing demand for oil, the debate over the soaring cost of energy in recent weeks has been about boosting supply and more regulation of "speculators." To boost supply, many want OPEC to bring more crude to market and to open up more U.S. areas to drilling - off the coastlines and in Alaska. But OPEC countries are already pumping vigorously: Last week, Saudi Arabia could come up with only an additional 200,000 barrels a day. Getting from the country's current output of around 9 million barrels a day to over 12 million barrels a day - their target over the next few years - will take time. Some analysts don't even think it can be done. As for drilling more in the United States, years or decades are required to build the necessary pumping platforms and pipelines. Eventually, experts say opening up all the areas currently closed to drilling might yield between 1.5 million and 3 million barrels a day, although those numbers are extremely rough estimates. "Some of those conservation barrels can be had cheaper than the drilling barrels," said Samantha Gross, an oil analyst at Cambridge. "It has an immediate effect, and it's happening." When it comes to restrictions on energy investors, there are several bills in Congress that would curb so-called speculation. But it's highly debatable what impact that would have. Several studies show commodities that are not traded on open exchanges have risen just as fast as oil, suggesting speculators are not unduly driving up the price of crude. Long-term conservation strategies could be even more effective at easing the stress caused by energy costs. Combined with short-term fixes, efforts like raising fuel-efficiency standards and using more biofuels could ultimately save nearly 5 million barrels of oil a day. Down the road, more electric cars could boost that number substantially. In late 2007, Congress raised fuel-efficiency standards for the first time in 30 years. Cars will be required to get 35 miles a gallon by 2020, up from about 25 miles a gallons today. That move, along with less driving due to higher prices, is expected to reduce oil use by a million barrels a day by 2020, according to Cambridge. The Natural Resources Defense Council is pushing for even higher fuel economy standards - 50 miles a gallon by 2030. That move, they say, would save over 2 million barrels of oil a day. Mandates to use ethanol in gasoline - if met - would displace an additional 1.3 million barrels of gas a day, which is roughly equivalent to 1.3 million barrels of oil, according to Cambridge. The total of nearly 5 million barrels in savings a day is still just a small amount of total global consumption in a world where energy demand is rising rapidly, so conservation alone shouldn't be expected to drastically bring down the price of oil. But as Natural Resources' Lovaas said, "It is likely to keep prices from rising so fast." Then there are electric vehicles. Cambridge estimates that by 2020, 6% of the cars sold in the United States will be electric cars that have on-board gas engines to charge the batteries. As there would be so few of them on the road, the savings in oil would be relatively small. But if the entire car fleet were switched to electric, that could put a major dent in oil use and cause prices to drop substantially. Cambridge said gasoline use would plummet by 70% in the United States if all passenger vehicles were electric, while electricity consumption would rise by just one-sixth. Of course, it's not just what people drive that uses gas - it's how much they're driving. Reducing gas use will also depend on getting people to drive less. And that will require moving people closer to work, or work closer to people. In other words, better urban planning. "This is a very significant element," said Mark Muro, policy director at the Brookings Institution's Metropolitan Policy Program. "When people go about their business, they need to have short trips." A future fuel-efficient city could include denser development, expanded mass transit, and mixed use zoning to allow business and stores to be located in the same neighborhoods where people live, said Muro. "It will take time, but we're going to need all the savings we can get," he said. Speaking of all the savings we can get, none of these conservation efforts need to be done independently of actively looking for more energy or seeking alternatives to oil. In a world of high prices, strong demand and limited supply, the nation may decide it needs to both use less and drill more.